With our long term vision for improving efficiency of Indian industries, we provide online 5S client support, for benefit of all industries. As, the main intent of this is to spread awareness, the Service is provided free of any cost. Any industry, or any person facing problem for implementing 5S or any other efficiency challenge can directly contact our online support team. Email: Dedicated email id for customer/ client support is support@breval.co.in . We can be contacted any time through mail. Our expert team will revert you back with support solution with in 24 hours. This is service is available on all week days. Phone Call: Dedicated phone no. is assigned for tele-support on any issues relating to 5S implementation. 4 hour slot is dedicated for tele support services. The free tele-service is available on Saturday 11:00 hrs to 13:00 hrs &15:00 hrs to 17:00 hrs. Call 9971467155. Skype support can be made available in case of any special requirement. Online 5S Client Support will help in spreading knowledge and awareness across industries. FTA is fault tree analysis, used for identifying causes required for a particular fault/event to take place. This technique uses basic symbols of electronic & logic field. The Fundamental symbol used are AND & OR gate. The failure mode being studied is called head event. Further power loss can occur if the incomer power supply fails & the emergency generator also fails at the same time. Over load can occur due to chocking in pipe line, or, the isolation valve is closed. Coil can damage due to over current or moisture ingress. Process interlock can be operated due to instrument malfunction or real high vibration. All the identified events can be given probability of failure depending upon MTBF calculated from past events. In case both events are required for resultant event to occur ie. AND gate, the probabilities are multiplied. In case, any one input can have the resultant impact ie. OR gate probabilities are added. 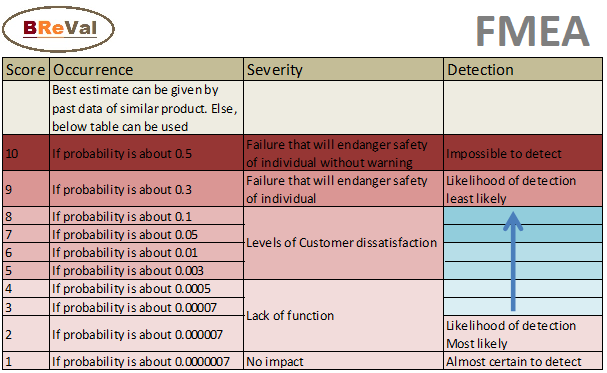 The FTA Analysis is done for finding out all probable faults possible. This enables us to attack on right cause for identify & eliminating the fault. check some of these interesting posts of time management and of super organiser as well. An Engineering technique for system reliability improvement. FMEA refers to a structural tool to identify potential failures at component level, the causes of these failures, and effect these failures will have on the operation of the system. 1. Determine product & gather associated data. 2. 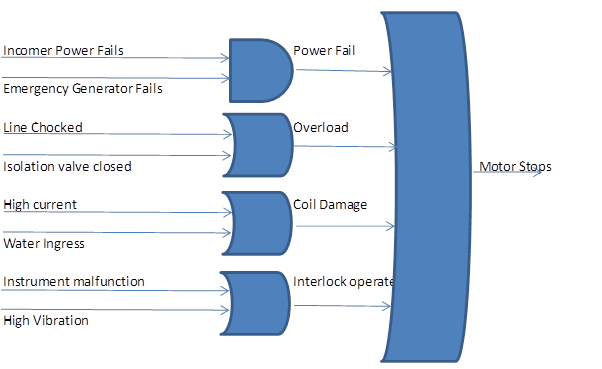 List all the possible failure modes. This is a very important step, and should be given enough time and resources. For each failure ask how, where, when and why. 4. Put all in descending order of RPN nos. 5. Development of action plan which the team deem most significant. 6. Failure with high Severity no. should be given importance even if RPN no. is low. Detection: An estimate of probability that the failure would be detected, if occurred. This is a Before-the-fact action, not an After-the-fact action. 2. Quality engineering. This is to improve process and is termed as PFMEA (process FMEA). 3. To prepare maintenance strategy of installed equipment. 4. Proactive identification and elimination of potential of failures. Check some related post of FTA AND Waste in Lean Management also.